That freelancer you lined up for your big project just bailed on you. And you need to start in 3 days. You’re probably guessing that we’d suggest you called Vitamin T. And you’d be right. But before you call us, we thought we’d pass along this handy primer on the BEST ways to work with an agent or recruiter, so you can spend the least amount of effort and get the best results. We picked the brains of two of our pros, Kallie Bonnell and Carolyn Desmarais, for tips bound to save you HOURS, if not DAYS in your search for stellar talent. You cannot provide too much information or feedback. In fact, recruiters want to know everything about your open position. The more they know, the better they can match what you REALLY want to the talent they meet - and the better they can get that talent excited about your role and company even before you meet them. 2. Know your "must have" and your "it would be nice" lists. Very few talent are truly ambidextrous. Know what you must have and what you’re willing to train. Even though freelancers are used to jumping in to save the day, they will no doubt need your help with some aspect of the job. Send along a wish list with 3 to 5 MUST HAVES, ranked. That will help your agent know where NOT to be flexible and increase your chances of having a WOW experience. 3. Be clear about your expectations. Try to be as comprehensive as you can about the job’s duration, the deliverables, and your budget. Recruiters totally get that things can change (i.e., your client changed their mind), but to find the best person for the job, they need to know as much as you do. That way you can be sure you get someone who a) is available, b) is capable of producing what you need, c) has just the right amount of experience and d) is within your budget. And when things DO change, see point #1 above! Don’t forget that your agent wants the same thing you do: A Perfect Match. 4. Prepare to give feedback. Feedback is essential to finding the best person for your business and speeding up your search. Be as specific as possible, but no matter what, be candid. And be sure about one thing: The FASTER you give feedback, the faster you’ll have more options and closer you’ll be to having the ideal candidate on your doorstep. 5. Have a start date in mind and manage the process to that start date. The best talent these days move REALLY fast. Gone are the days of 30+ days to make a decision. In a tight job market, clients (like you) know how hard it is to find the needle in the haystack of jobseekers. Your first choice will likely have other offers within days of your interview (if they don’t already by the time you interview them! ), so if you really want someone, make sure you close the deal right away. 6. Don't be afraid of working interviews and contract-to-hire. The past several years we’ve seen a HUGE uptick in the number and caliber of candidates who are interested in trying out environments before they take the plunge - especially in the creative industry where fit and style are as important as the job details. If you use Talent Bridge or a temp-to-perm option, you can have someone DOING the job while you assess their skills and fit - and have the flexibility to move faster when you’re ready to make a hire. It also costs a lot less to try someone out than to make a bad hire. 7. 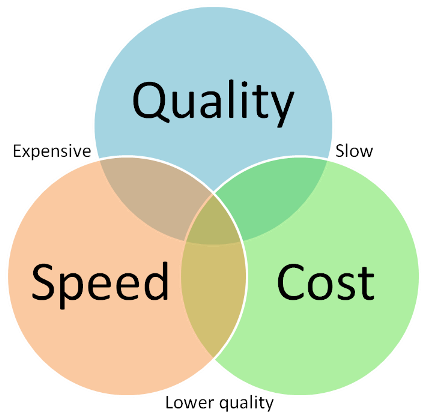 Be aware of the Cost, Speed, and Quality conundrum. Everyone is familiar with how this works, you only get two of three. If you need a someone tomorrow morning, the quality or cost will be affected. If you need the BEST OF THE BEST, the cost or timeline will need to be flexible. So make sure you know what your project demands, and be prepared to pick your top two! 8. Listen to your recruiter/agent. Your agent is your PARTNER in the hiring process. Build a relationship, be open and candid, and make sure communication flows easily and quickly in both directions. After 28 years in the creative staffing industry, we know that that doing OUR job well helps you focus on YOUR job. Now let’s get to work!